This healthy granola is perfect for breakfast, on yogurt or just as a snack. Low in fat, full of whole grains, proteins and fruit; you just can’t go wrong. I’m surprised every time I make this at how easy it is to put this together. My secret ingredient? Egg whites. Frothy, bubbly egg whites are the key to making this recipe so crunchy. Make sure to use egg whites from a whole egg, the boxed liquid stuff doesn’t work as well. Preheat oven to 300°F. Line baking sheet with parchment paper, or coat with cooking spray. In a large bowl combine all ingredients but egg whites and dried fruit. Mix until all ingredients are well incorporated. Whisk the egg whites until frothy and a light white color. Stir the egg whites into the granola until all ingredients are well coated. Spread the mixture in a single layer on prepared baking sheet. Bake 45–55 minutes. Halfway through the baking time, carefully use a spatula to flip over large sections of the granola. Try not to break it up too much. Once the granola is lightly browned and feels dry to touch remove from oven and allow to cool on pans. 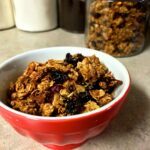 The granola will become crunchier as it cools, so make sure not to over bake it. Once it has completely cooled, break up into desired clusters and sprinkle with dried fruit. Recipe Note: Nuts are a great addition to this recipe. Any kind works but I prefer walnuts, pecans, pistachios and almonds.